Even as a “non-decorator,” I understood the pop-culture reference; summoning the Noun/Verb/Adjective to imply that one would channel the fictional character Clark Griswold played by Chevy Chase (an actual fictitious name originally) and display as many yard decorations as gaudy and excessive as time and finances will permit; an idea that the VPLD (Violent Proliferation of Lawn Decorations) has been begging people to take notice of for some time to no avail. Oh, and the VPLD is REAL…….well, in Zulu Delta land anyway. One December afternoon, I was driving through a large suburban neighborhood with the Sun shining when it suddenly hit me; all the air-filled Santas, reindeer, snowmen, and elves were all deflated and laying out flat on the lawns. I began to think, and then think faster. Initially, I thought they were defective. I then ran through the control scheme. I imagined the lawn “people” are now blown up by mini weatherproof pneumatic compressors on timers, which also illuminate the device. This led to my thoughts on how only people who drive by at night are ‘treated” to the festive display, and how people riding by during the day are left with the crappy display of wet heaps of colored plastic. Uggggggg! If this realization wasn’t enough, why not throw in one last shot of “overactive imagination?” Here it is; Lawn Santa is a neighborhood Whino! That’s right. Imagine that guy we used to know from “down the street.” That one out in the middle of the intersection, singing and dancing around. He has black pants and a black button down shirt; complete with a Priest collar (not a real Priest of course, and not such a different idea as my friend Comrad B. has about dressing up as a Bishop or Cardinal.). He has a toy gun holster around his hip, and red rhinestone cowboy boots, along with it, a white corncob hat. In one hand he is waving around a bright fluorescent, green plastic toy pistol drawn from his belt, and high up in the other hand, he’s waving around a bottle of Maddog 20-20 all wrapped up in a brown paper bag. Let’s call him Hubcap Jack. Then there’s lawn Santa, who now that the Sun has gone down, is marching up and down the lawn doing cold shots of eggnog with his all-of-a-sudden come to life plastic friends; waving like a crazy man to everyone he doesn’t know or even see. They’re yucking it up singing yuletide nonsense that nobody wants to hear. Life is a big party, complete with bright lights and endless flasks of North Pole libation. 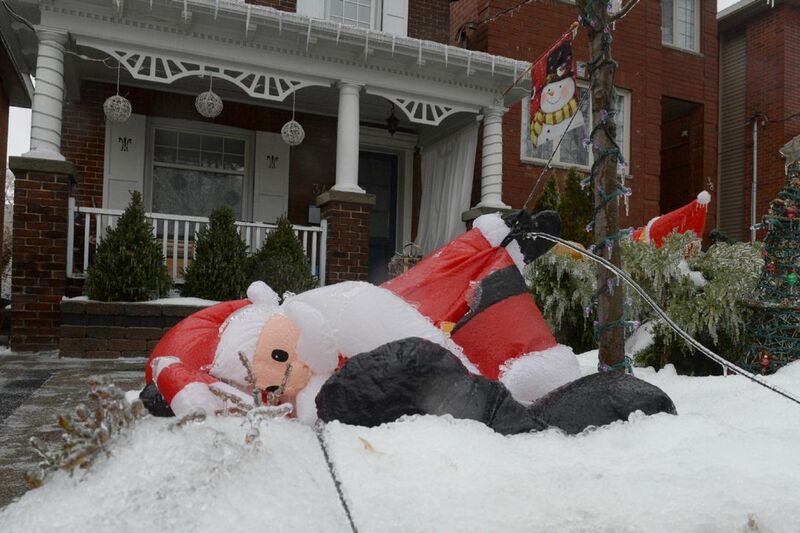 Lawn Santa is on a bender. Suddenly, in literal action, a switch gets flipped. The electricity and Santa are cut off. No more parties, no more pals. For those of you saddened by my observation, don’t worry; Sunset in the Northern Hemisphere in December rolls around near 1600 Hr (4 PM). “Wet heaps of colored plastic.” That sounds even more disgusting than when I wrote it……AWESOME! I have to agree that lawn decorations during the Christmas season are getting out of hand. A few Christmas lights used to be something special. But it doesn’t seem so special anymore when almost everyone goes over the top. Sad looking Airless Santa on the lawn. Great post to start the blog challenge with, great imagination. 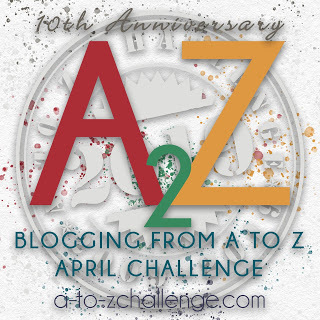 I am just now catching up with my A to Z friends, ZD! Thank you for that Hem ref! All I can think about is the commercialization of every holiday and how almost everything related to these gaudy decorations is plastic. Plastic that the world is drowning in! On to your next post!